MongoDB is a NoSQL database that provides high performance, high availability, and automatic scaling. NoSQL database means that, unlike MySQL or PostgreSQL, it does not support SQL (Structured Query Language) to retrieve or manipulate the stored data. MongoDB does not store data in tables, instead, it stores data in a "document" structure similar to JSON (in MongoDB called BSON). MongoDB was first introduced in 2009, six years ago. Currently developed by the company MongoDB MongoDB Inc. In this tutorial, I will guide you to install and configure MongoDB 3.2 (stable) on a CentOS 7 server. We will add and configure the administrator user for MongoDB and configure the authentication for MongoDB services. Enable MongoDB authentication and Testing. We've added MongoDB repository, now check the repository list on the server to make sure that the MongoDB repository is available in the list. You sould see results below. The MongoDB repository is on the list. 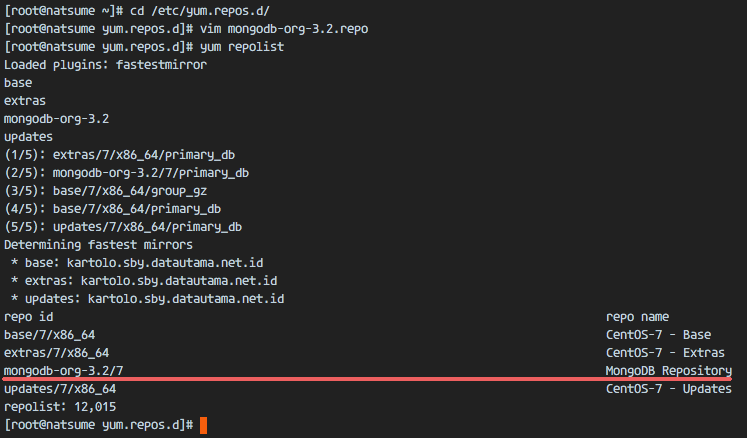 Next, install MongoDB with the yum command. Check that MongoDB is running by checking that the port '27017' is open. And make sure the mongodb service is active. You will probably see this error about ulimit configuration on the server. Ulimits or User limits define how much of a system-wide resource a user may use. In order to resolve this problem, we need to increase the ulimit configuration of the user mongod. On CentOS 7 server, the MongoDB database is running under the user 'mongod'. Go to the 'security' directory and edit the 'limits.conf' configuration file. I will increase the limits of the mongod user to '64000' - number of processes or nproc and the number of open files or nofile to 64000. 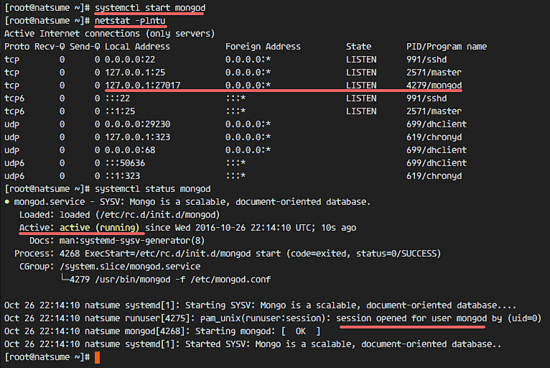 Then restart the MongoDB service and try again to access the mongo shell, the error is gone now. 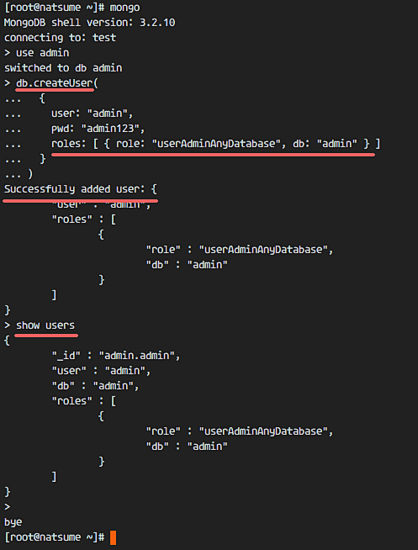 In this step, we will create a new user "admin" for MongoDB with the role 'UserAdminAnyDatabase' from the mongo shell. I will create new user administrator named 'admin' with password 'admin123'. Please use a secure password on your server. Then we will configure the role of the user to be 'UserAdminAnyDatabase'. Switch to the database 'admin'. Next, ensure that the user has been created with the MongoDB query below. The MongoDB administrator user has been created. In this step, we will enable authentication for users to prevent that another user without sufficient privileges is able to see the data on the database. 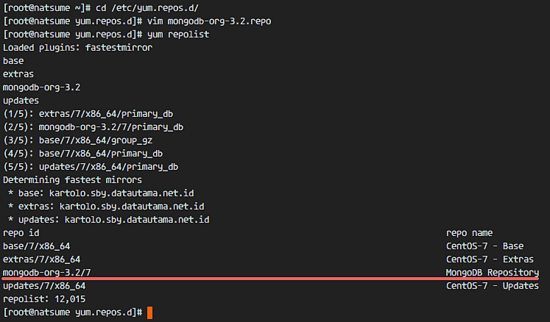 On our CentOS 7 server, MongoDB is running under systemd with an init script in the '/etc/init.d/' dirctory. 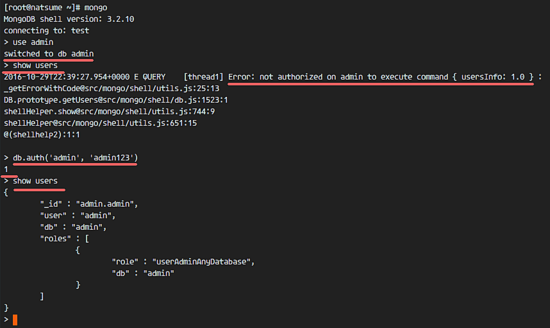 We will edit that script to force the mongodb service to run with the '--auth' option. On line 15 you will find the "OPTION" variable, there we will add the "mongod" option. Reload the systemd service and restart MongoDB. 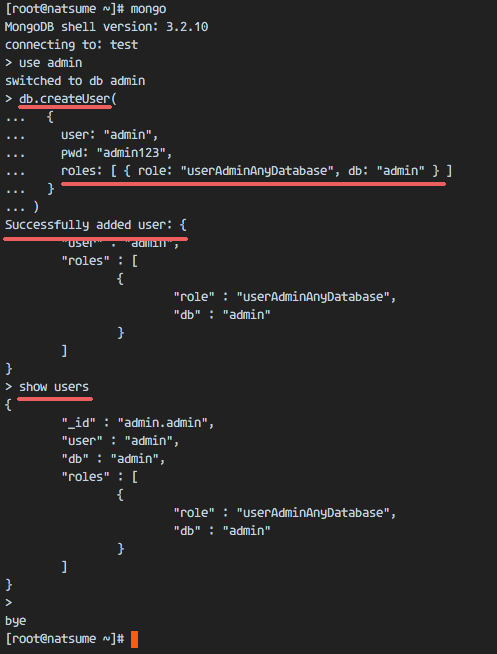 Next, we have to test the configuration by logging into the mongo shell and switch to the admin database, then try to see the admin users. You will see an error about the unauthorized execution of the command in the database admin. Now we need to use the command 'db.auth()' for the authentication. Now you can see the users with their roles and the privileges. MongoDB 3.2 has been installed and configured on a CentOS 7 Server. Thanks, whoever you are! Everything worked exactly as indicated on this web page. This is probably the first time I have run through CentOS 7 product install instructions where every single command worked exactly as shown, with no trouble at all.